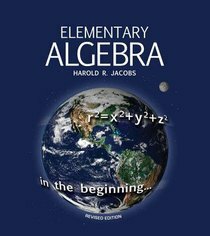 Jacobs Elementary Algebra has come to be so highly regarded in the homeschool market. This high school algebra curriculum provides a full year of math in a clearly written format with guidance for teachers as well as for students who are self-directed. The primary student text is divided into 17 sections, covering functions and graphs, integers, rational numbers, exponents, polynomials, factoring, fractions, and more. As the student works through the text, select solutions are provided in the text, with full answers available in the solutions manual.